The Small House Rotunda is one of the most architecturally significant spaces in the U.S. Capitol. It was designed in 1804 by architect Benjamin Henry Latrobe during his first building campaign after he was appointed by Thomas Jefferson to construct the south wing of the Capitol Building. In the south wing, Latrobe created a progression of spaces from the entrance door on the first floor up a grand staircase to the small rotunda in front of the principal doorway leading into the Hall of the House (now called National Statuary Hall). Once his design was approved by Jefferson, it was built in 1806–1807. The spaces have Seneca stone flooring and sandstone columns. The vaulting is simple and majestic. The columns and their capitals are fine examples of the Greek order. The capitals are based on those at the Tower of the Winds in Athens, whose design was widely published in the 1765 edition of Antiquities of Athens by James Stuart and Nicholas Revett. The decorations are in the neoclassical style, placing these rooms among the earliest uses of the style in America. Fortunately, this space was not damaged when British troops burned the Capitol in 1814, and today it is one of the oldest rooms in the U.S. Capitol. Coffers with rosettes decorate the dome. Both the stairwell and the small rotunda were lighted by a lantern, a small circular turret ringed with windows that originally admitted natural light and air to the corridors below. In the mid-1820s the architect Charles Bulfinch, reacting to complaints from the members of the House of Representatives that their wing (unlike the Senate's) had no marble staircase, set about to retrofit a circular staircase into a square space. He removed the wall and columns on the south and the low wall and windows on the west circa 1828, unfortunately disrupting the symmetry of the room, and he created the “shell” on the south wall of the stairwell as ornamentation. In the small rotunda area Bulfinch created two scalloped niches for statuary. The sandstone columns were originally painted white. As a result of an 1898 gas explosion on the Senate side, which did extensive damage, Architect of the Capitol Elliott Woods rebuilt the roof over the old north and south wings, helping to make the building fireproof by replacing the wooden structure with steel. In a 1907 effort to restore the historic appearance of the corridors, crypt and small rotunda, Elliott Woods removed the plaster and paint from the brick walls; imitation sandstone was applied in their place on the House side in about 1915. This easily maintained surface did not require yearly painting. Over the subsequent years, the areas have been painted in different color schemes depending on the fashion of the time. The current paint scheme in the small House rotunda dates from 1990s and was selected by senior staff members. Currently lighting this circular staircase is a large three-tier, 30-arm bronze chandelier with heavily frosted hurricane shades. Made by Wibes Manufacturing Company, it was installed as part of the improved illumination program of 1960–1962. It can be raised and lowered by an electric winch for cleaning. The small House rotunda is lit by a 21-arm Williamsburg colonial-style brass chandelier that holds electric "candles." This and a matching chandelier in the ground-floor space are two of fourteen transferred from the Supreme Court Building in 1963–1964. In this space are displayed sculptures spanning two centuries. 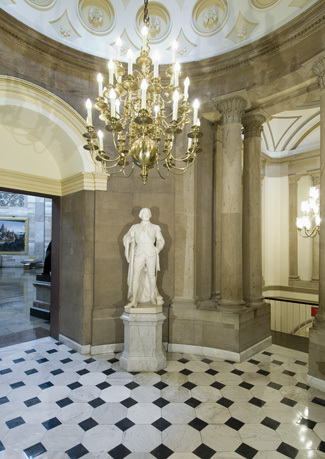 On the lower level is the bust of Lajos Kossuth by Csaba Kur (placed in 1987). The bust of George Washington by Antonio Capellano at the foot of the circular stairs was originally placed over the East Front door in 1827. Lincoln the Legislator by Avard Fairbanks stands to the right of the doors. The bronze Amateis doors displayed on the north wall were designed for the main central entrance of the Capitol’s West Front. Sculpted by Louis Amateis (1855–1913), they were cast by the Roman Bronze Works in New York and were completed in 1910, but they could not be placed at the Capitol because the legislation for the improvement of the west front was not enacted. The doors were exhibited at the Corcoran Gallery of Art for four years and then displayed at the Smithsonian Institution’s Natural History Building from 1914 to 1967. They were then returned to the Capitol and stored until 1972, when they were placed in their present location near the Memorial Door (then called the Document Door).